I like bacon almost burned. We don’t eat much bacon at our house. Actually, I don’t eat much of anything even though I like to cook and talk about food. Eating is something I need to work on since my handsome and fit 6’6″ husband loves food and is frequently thinking about his next meal. He’d appreciate it if I expressed more excitement for food. Before my spinal cord injury I used to be obsessed with food. Even though I wasn’t fat or even heavyset, my thoughts focused too much on food and I’d pray, ‘Dear God, please help me not care so much about food and my weight!’ My fervent prayers about a food and weight obsession when I was a teenager gives me an appreciation for eating issues and disorders so many have today. Strangely and thankfully, since my injury, food has not been an obsession for me. 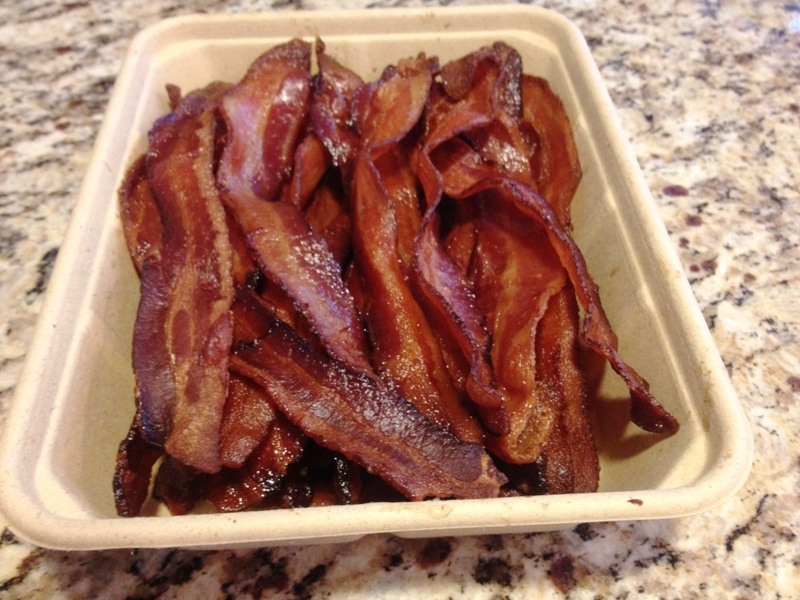 Now, I’m free – free to enjoy a few slices of bacon without guilt and without wanting more. Well, sometimes I want more. Bacon is nice to have on hand for a quick BLT sandwich or an occasional topper for salads and potatoes. What I don’t like about bacon the is the mess it makes when you cook it on the stove or griddle. Yes, the oven is a cleaner option, but it takes a long time, and the microwave is not the same, right? I used to be convinced that the easiest and most practical way to get bacon was to cook it in the oven. There’s no splatter and it’s easy to clean the pan if you line it with foil and use a rack with non-stick spray. Then you can refrigerate it in ziploc bags and use it as needed – don’t eat it all at once or you’ll pray, ‘Dear God, help me stop’. Recently, I discovered life’s best way to get bacon. At last! Drum roll please….Buy it already cooked off the Whole Foods breakfast bar! For those of you who don’t have a WF near you – so sorry. Maybe there’s another breakfast bar close by, or maybe you’ll have to go to a bar, order a sparkling water, cry, and eat free peanuts and pretzels. 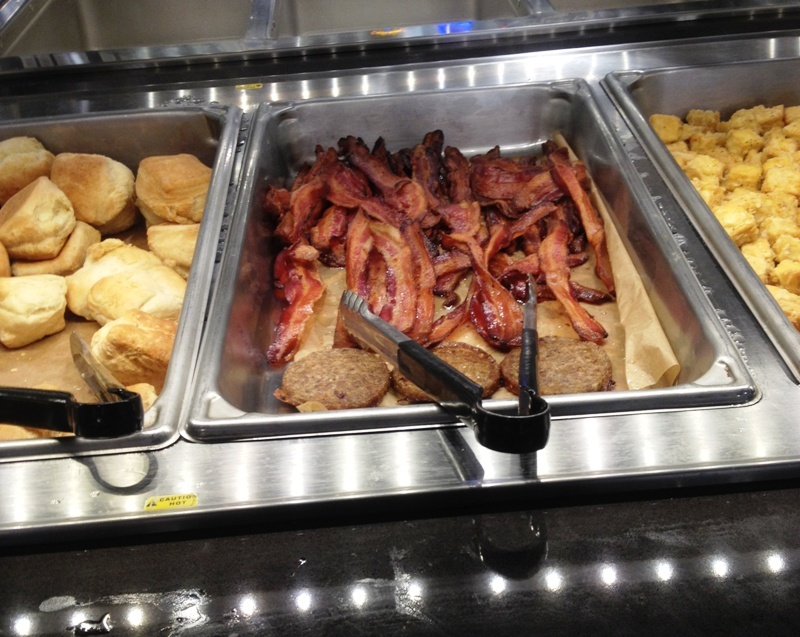 Even though the WF breakfast bar is $8.00/lb you won’t believe how much bacon you can get for $3.00 when it is pre-cooked. It’s easier and less expensive than buying it uncooked. Plus, WF has the hearty, thick bacon. Just make sure you skip the ‘heavy’ (expensive) scrambled eggs, cheese grits and oatmeal, and fill your box with ‘light’ bacon. I’m warning you…don’t be tempted by those expensive cheesey grits. Once you get the bacon home, refrain from eating more than a few pieces or you’ll pray, ‘Dear God, help me stop’. Refrigerate it, and use as needed. You may not get that permeating delish bacon smell throughout your house, but it’s a small price to pay for this almost grease free convenience. The last time I went to WF to get bacon, the lady that helped me fill my box told me a lot of people buy a box of bacon...and I thought it was my secret! 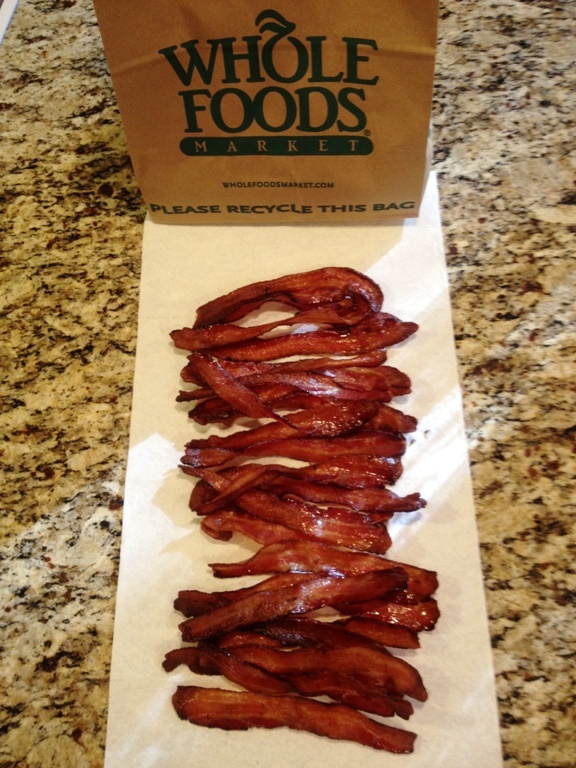 Thank you Whole Foods for your BACON bar!